How a husband-and-wife team created the world’s first open-access, open-source international air quality data hub. wanted to work internationally, but they didn’t know exactly what form it would take. Then one day, Hasenkopf was speaking with a researcher in Mongolia when the colleague shared a photo showing the view from his hotel window in Ulaanbaatar, Mongolia’s capital. The air pollution was so severe that it was clearly visible in the photo. Air pollution in Ulaanbaatar can make it look like the city is constantly covered by fog or smoke. Photo courtesy of Einar Fredriksen via Flickr. Although neither of them had expertise in air pollution specifically–Hasenkopf had some relevant knowledge from studying particulate matter on Saturn’s moon Titan–the photo inspired the couple to move to Ulaanbaatar and learn more. They quickly realized that despite the obviously severe pollution, residents and decision makers had virtually no local data on air quality. Without data, it would be difficult to document the devastating health impacts of Mongolia’s pollution, or to get traction to make things better. Drawing on Hasenkopf’s atmospheric science knowledge and Flasher’s software development skills, the couple collaborated with the local science community to build Mongolia’s first social media-based air quality data sharing platform. It wasn’t long before the platform elevated the conversation about air pollution in Mongolia. National new outlets covered the project, and the team was invited to present research to the Mongolian Parliament, the U.S. Embassy and the Canadian Embassy. 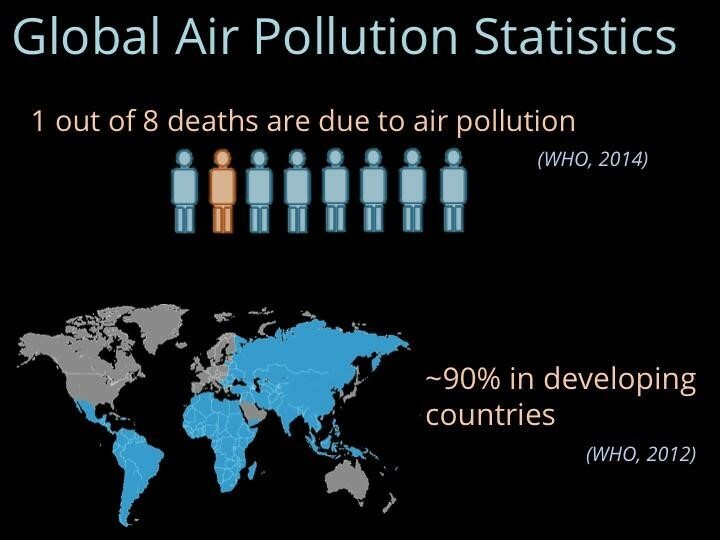 Poor air quality causes 1 in 8 deaths worldwide; the toll is greatest in the developing world. Graphic provided by OpenAQ. Empowered by the success of that first project, the couple decided to expand their focus from Mongolia to, well, the entire developing world. According to the World Health Organization, poor air quality is responsible for 1 in 8 global deaths, and 90 percent of those deaths occur in developing countries. Yet the developing world, where the problem is most acute, is exactly where data is scarcest. To address this gap, the team created OpenAQ, the world’s first free, open, real-time, international air quality data hub. While many developing countries and localities do collect air quality data, it is typically not archived, standardized or aggregated. The OpenAQ platform is designed to harvest and bring together real-time data from the thousands of official, publicly available data sources around the world, both large and small. The data is then captured and archived to make it available for research. The strength of the OpenAQ platform lies in its open access model and its open source code. The data is available for any scientist, journalist, educator or policymaker to freely access, and for any software developer to create apps for. OpenAQ was recently awarded a $15,000 “Sharing Solutions” grant from the Thriving Earth Exchange and Amazon Web Services, which allows the team to use Amazon’s cloud-computing services to store and share data and code. “[Winning the award] is a huge opportunity to scale up our platform, get more data, and share it out,” said Hasenkopf. Some of the world’s most polluted cities are also those with the least air quality data and research. Graph provided by OpenAQ. In addition to providing a platform for data sharing, OpenAQ also hosts workshops and creates tools to guide users. The ultimate goal of all this is to inspire scientists, activists and engineers to create data visualizations, analytics and software that can be used to influence government policy in order protect public health. OpenAQ tracks such projects on its blog so involved researchers, developers and community members can learn from each other. Hasenkopf is confident that OpenAQ could also add value to international projects like the World Health Organization’s Outdoor Air Pollution Database and the Global Burden of Disease study. To date, the data aggregated by OpenAQ has been accessed from 674 cities in 88 countries. The team hopes the platform will provide a sustainable, community-driven environment for concerned individuals to come together, use data, and find solutions for some of today’s most pressing environmental health issues.